Religious tattoos show one's devotion. Unlike other iconography, the tattoo of two praying hands is not set in religious doctrine, but in real life. Praying hands tattoos are a great way to show off your faith or remember a loved one. 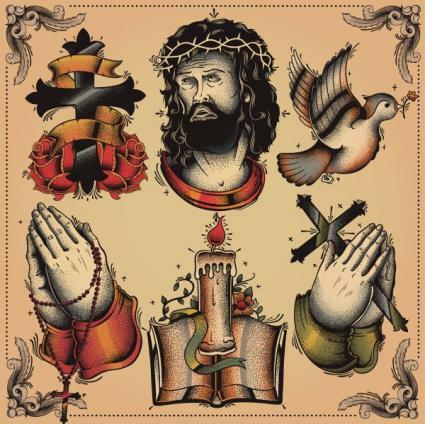 The praying hands tattoo works well alone, but many people like to stylize the image to their own artistic likes and dislikes as well as their own beliefs. Catholics who get this type of tattoo will often choose to show the two praying clasping a set of rosary beads. This signifies their faith and devotion to their religion and God. The Lord's Prayer works very well coupled with the praying hands, as do other psalms and bible quotes. Any scriptures that means a lot to you in your faith can be added to the tattoo in any form or variation you choose. Bible images are often paired with praying hands tattoos, providing an additional expression of the wearer's devout beliefs and faith. The hands can be displayed resting on or silhouetted against a bible. Crosses are another image that incorporates easily into the praying hands image. The hands can hold the bottom of a cross, while the top extends up past the hands. A cross may also be visible just to one side of the hands as part of a separate, but connected, image. Encircle the hands with a laurel or crown of thorns to layer symbolism and meaning onto the hands. A crown of thorns may also be placed just in front of the hands, as if laying in front of them. Sometimes the praying hands will be included in portrait art as found with the Virgin Mary praying and holding a rosary. Other saints, such as Padre Pio, can also be artistically rendered in prayer. Doves have long since been a sign of peace and they were even the sign to Moses that the flood was over. Praying hands can be combined with doves to symbolize the peace and tranquility of the soul. Like the Virgin Mary, praying hands can also be seen with a light surrounding them. This gives the appearance that the light of Christ or God is shining down on you. A common reason to get a tattoo is in remembrance of a loved one. Praying hands can serve as a symbol of your love for a deceased family member or friend. Perhaps you could get the praying hands with their name underneath. You could even add, "In loving memory of…" and then insert the name. Another addition could be their birth date and date of death. Another thing you may want to add to a tattoo done in memory of a loved one is add an extra item that symbolizes them or your favorite memory of them. 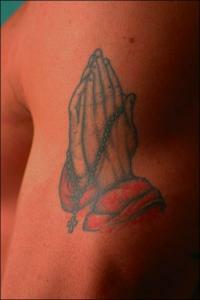 Praying hands are a Christian symbol often selected for tattoos as a remembrance to the power of Christ and prayer. Alongside tattoos of the Virgin Mary or the cross, there is no religious symbol more recognized or easily interpreted as the depiction of two hands praying. 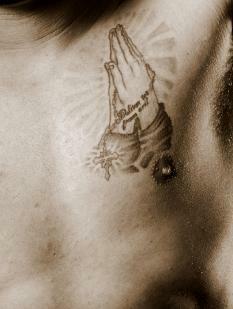 The tattoo itself is a symbol of the strength of prayer. Although many people will get the praying hand tattoo to signify their faith, the art itself has a deeper meaning. It represents dedication to self and family, courage and sacrifice and respect. The tattoo showing two praying hands is a powerful image. Go over your tattoo design with your artist carefully, to ensure it looks the way you truly intend it to. This tattoo should be a celebration of your faith or memory, and the final result should show the care that went into choosing it.